Since my players are the best players, I created a little video for them to check out of their adventures afterwards. I asked each of them for narration; some got back to me, and I used their text, others I filled in the blanks based on their characters. I hope you enjoy it and it gives you a few ideas for how to wrap-up your games at home. Note that Contraband and Weapons are black and red, respectively. These items are either illegal or restricted, and carrying and selling them could come with additional risks, requiring a Streetwise or Negotiation roll to find the right buyer. Luxuries (like the dwindling supply of Alderaanian Pinot Noir that survived by being in off-world cellars) are rarely found cheap, and most of the time command a fair price – but once in a while, you find a whale that is desperate for that Rancor-foot desk wastebin you’ve been hauling around. 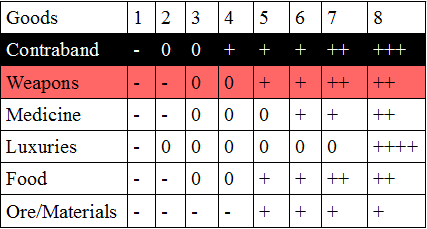 You could even use these randomized, simplified rolls to generate story – did you roll an 8 on Medicine? Perhaps there’s an outbreak on the planet. If the players think to run to Thyferra to pick up Bacta cheap, have them keep in mind that everyone will have this info, so they’ll need to be cunning astrogators to get to Thyferra and back in time to cash in on their plan. This isn’t a super-deep system, by design, but it’s a little something to make your home game a little more interesting and hopefully give your players something to do with all their ship’s cargo space. We love games here at the NPCCast, and we’re honored to be nominated for the 2015 ENnies. While you’re free to vote for anyone you think deserves the accolades, I’ve got a few suggestions if you find yourself voting. We don’t offer a consensus opinion on every category, and do be aware that it is instant-runoff voting, so even if you prefer another product more, consider giving down-ballot votes to some of our favorites. Best Monster/Adversary: 13th Age Bestiary. In no other monstrous folio would there be such care and attention – not to detail and Gygaxian Naturalism as in other books – but attention to fun as the 13th Age Bestiary be given to the lowly Bat. The creators of this Monster Book give so much love, and so many great, evocative adventure hooks to even the most pedestrian of opponents that we have to strongly endorse it. Best Adventure, Best Cartography, Best Production Values: Horror on the Orient Express. It’s a bona-fide classic, and this upgrade/re-release gives it all the love it deserves. Featuring gorgeous, well, everything – from train tickets to usable telegrams. Absolute perfection. Best Art – Interior, Best Miniatures Product, Product of the Year: IRON KINGDOMS UNLEASHED. The Adventurer’s Kit is the most value we’ve ever seen at its price point, from intricate pre-assembled minis to amazing modular terrain. The full core book’s art is just as full-metal-mayhem-filled as anything put out by Privateer Press. Best e-Book, Best Writing: Ken Writes About Stuff. Show guest and FriendPC Kenneth Hite is probably the most correct person working in RPGs today. Best Publisher: Fantasy Flight Games. In addition to all the tabletop offerings with their attention to detail and high-quality components, FFG has been killing it on the RPG front by releasing 3 compatible RPGs in the various eras of the Star Wars mythos, each with production values and writing and especially art to top the last. and of course, Best Podcast: NPC Cast! Thanks for voting! After the adventures last week that took my players to a lost Sith battleship in Bothan space, they escaped with no loot but at least mostly intact, so they wanted to take a breather. No set plans, so they headed to Tatooine to get some time off. After touching down in Mos Eisley, their first goal was to get some bacta for the Wookiee who has 4 critical hits on him (don’t go into lightsaber range with a Sith General, kids!). Tatooine, however, isn’t some bacta-rich inner rim world. The players secured a bacta tank, but they weren’t able to find enough sources to fill it. 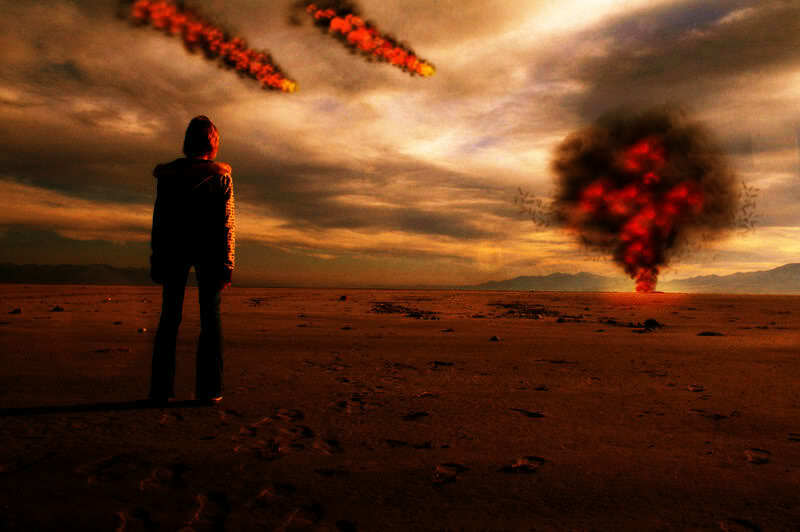 A trip to the mid-rim or further core-ward should get them in touch with the bacta cartel dealer needed to fill it. I could have hand-waved “yes, give me 4000 credits and you can have a bacta tank like it says it costs in the book,” but instead I made them go to the Imperial garrison (tricky, since two of them are wanted by the Empire), and work with the bored Imp functionary to “liberate” their bacta tank from the base. A trip to Wuher’s famous cantina, with Figrin D’an and Modal Nodes tootling along on their Omni Boxes led to the players finding a gun runner lounging in the corner. 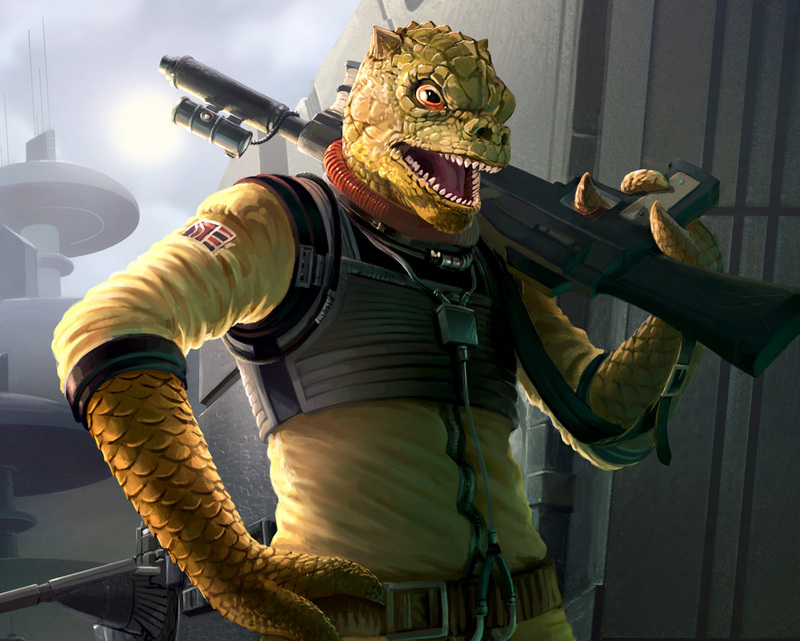 I didn’t intend to have a gun-buying experience in this game, but the players were looking for guns, and finding a gun runner was more interesting than the players not finding one, so they befriended the Trandoshan gun runner Jem Mavr. After spending a LOT of money on his increased rates (though less than his original, quoted prices when he considered them rubes), Jem invited the players out to his lodge in the Jundland Wastes (because I was having fun saying sibilant s’s since Jem was a Trandoshan so of courssssse all his sssss’s were sssssstretched out) to shoot targets. When they arrived, he showed off his wall of the really cool guns, including a Bowcaster. Our Duros pilot (with 1 strength)’s lidless solid-red eyes went wide when he saw it and demanded the chance to fire it. Jem agreed, and when the Duros rolled a despair when shooting at a target, he got blown backwards off his feet and bent the arm of the bowcaster. Jem was Not Happy. The Wookiee, who had been convalescing in the medical bay of the Elegant Knave, the party’s Ghtroc 720 light freighter, was roused from his rest by the sound of the party, along with Jem and his crew, arriving on board in the docking bay, demanding the Wookiee fix the weapon. Since the Wookiee’s obligation (his dedication to his mother) had been rolled that session, I declared as the bowcaster was set down on his work bench, he notices that the hilt is covered in his family’s runes. When he mentions them, Jem explains that he had to enslave a lot of Wookiees to get that weapon from them (Trandoshans are noted Wookiee slavers, having evolved in the same star system). The Wookiee of course swings the bowcaster cracking Jem across the mouth, and combat begins! It’s then that the Duros reveals the Sith Lightsaber he took off the Sith General they took out last game, and when the Captain sees Jem’s reaction, he realizes that none of Jem’s crew can leave the Elegant Knave alive. 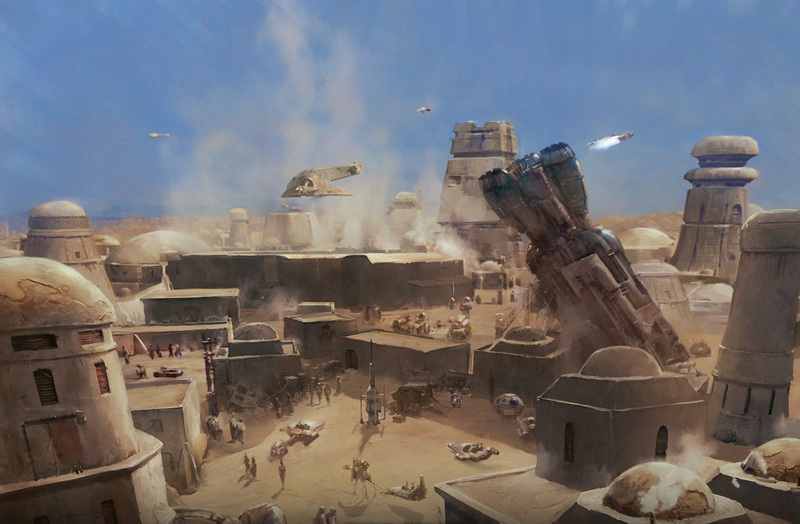 After a frenzied firefight, the crew takes the bodies of Jem and his gang, along with their Ubrikkan landspeeder and their swoop bikes back to his ranch in the Jundland Wastes, and dumped them off then tossed the Sith lightsaber and a Thermal Detonator (that they had just purchased) into the lodge and took off, ensuring that nobody knows that they had interacted with Sith as they took off from Tatooine with some fancy new toys, while also leaving them lighter in the wallets and still on the hunt for much-needed bacta. Originally, I had no plans for the evening other than “shopping session,” but between a timely Despair coming up and lucking into picking ‘Tradoshan’ as the race for the gun runner from the æther, it turned into a great session with lots of character growth, new toys for the players and laughs and smiles all night. Share your best “things turned out better than expected” stories from when you had to wing it with zero prep on our Facebook page. 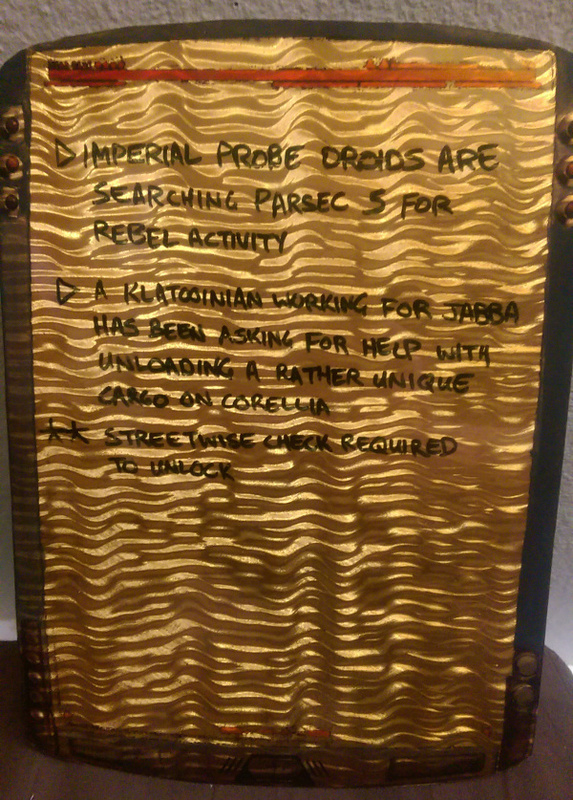 A blog post about NPC Del’s Star Wars Edge of the Empire game props! In acting (particularly stage acting) there’s something called ‘business.’ Business is a little thing or action an actor has to fill space when they aren’t currently speaking or doing something. Rolling a half-dollar over their knuckles, smoking a cigarette or cleaning their glasses are great examples. I love having that in my games as well, giving the players something to interact with even when they aren’t currently rolling dice or interacting with an NPC. The easiest way to get that is props. 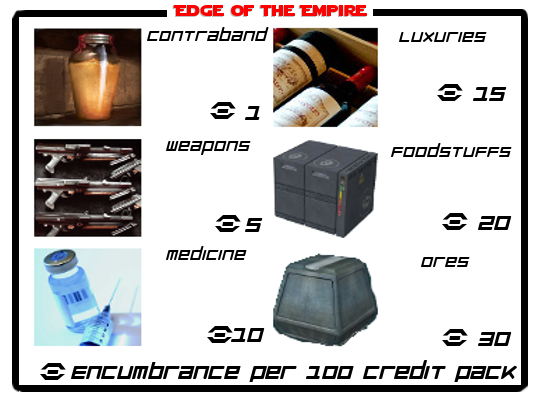 Very early on in my Edge of the Empire campaign I decided I wanted money to matter, down to about the 25 credit mark. But rather than have pencil erasers wear their way through the corner of a character sheet, I decided to do something a little different – actually make galactic credits! I started by photoshopping up the credit symbols, using the SF Distant Galaxys font. Then I reversed the image in GIMP and had it printed on plastic transparency sheets. I also used a similar process along with manipulating an image of a Star Wars datapad to create the infochant pipeline. Before each session, I can use a wet-erase marker to fill in juicy information (or worthless information) as a world-building exercise, and give them a heads-up on what’s happening in the Star Wars galaxy at large. If I want there to be a story or want to not immediately give up valuable info, I can attach a roll to getting it. These sorts of throwaway bits can go a long way to making players feel like they’re actually smugglers hustling to fill up their hold with supplies, and going to the location that they feel they have the best chance of unloading them at a profit. 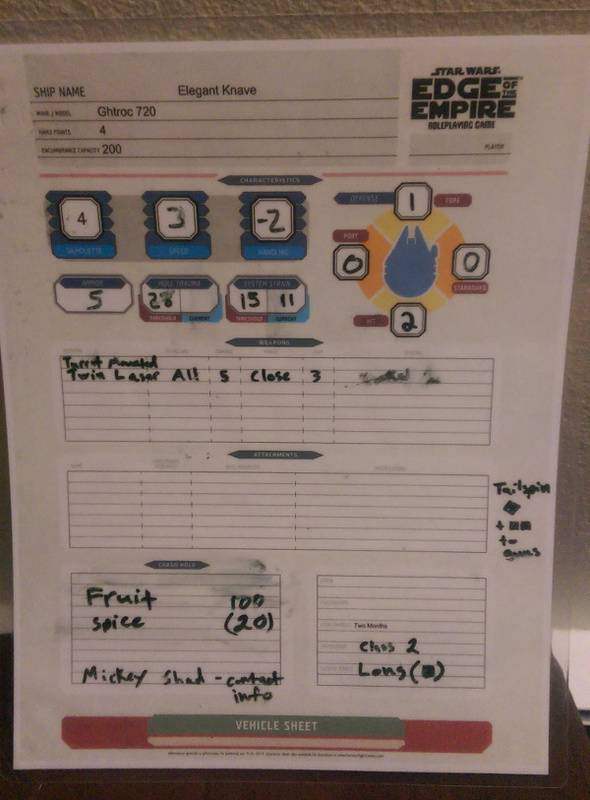 Speaking of supplies, I grabbed a fillable-form PDF of a Ship sheet from the Fantasy Flight Games community and completed the parts that were unlikely to change, then had it laminated. The crew has their own wet-erase marker to track things like crits, damage, cargo and upgrades. For 60¢ I have something that will stand up to the abuse of the DM’s bag, and is easily findable in the pile of papers every DM has with them all the time to hand out to the players. I hope these ideas will inspire you to create your own props to give your world just a little more verisimilitude, and to give your players a little more business to interact with at the table. Happy gaming! Episode 30: Mendrances and Beneflaws. NPC Cast Episode 30: Mendrances and Beneflaws. Titanium Wars: An “interstellar empire-building card game” by Iello. Magic the Gathering: Theros Artwork: What it says on the tin. Giant Bomb.com: An awesome multimedia site about video games! NPC Cast Episode 28: Winning Friends. Star Wars – Edge of the Empire: The new Star Wars RPG by Fantasy Flight Games! Warmachine Tactics: A video game Kickstarted by Privateer Press.